This is the thirty seventh in a series of reviews of the best dive resort locations around the world. In this post, the focus is Trinidad and Tobago. Background – Situated 130 kilometers (81 miles) south of Grenada and only 11 kilometers (6.8 miles) to the northeast of Venezuela is Trinidad and Tobago, the southernmost country in the West Indies. With the two larger and a number of very small islands it has an area of 5,128 square kilometers (1,980 square miles) and a population of around 1.5 million with 50,000 living on Tobago. In a comparison of per capita GDP in the Americas, it is behind only the U.S. and Canada and has a diverse economy with emphasis on petroleum, natural gas, petrochemicals, tourism, manufacturing, financial services, steel, fishing, citrus and cocoa. This constitutional republic has a rich multicultural population derived from African slaves and Indian indentured laborer with a variety of other ethnicities also represented. The national language is English with most speaking the local Creole variation. Culturally very rich, Trinidad is where calypso, limbo, steelpan and several other musical styles developed and a world-renowned Carnival is celebrated annually. 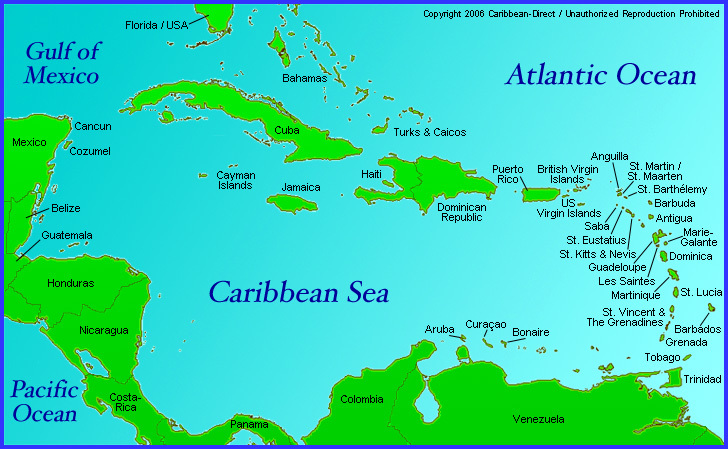 Two Nobel Prize winning authors called Trinidad and Tobago home at one point or another, V.S. Naipaul and Derek Wolcott. Undersea World – The Orinoco River drains out of the continent just to the south and the Guyana current brings the plankton rich water to Trinidad decreasing the visibility significantly while providing the nutrients to attract creatures like manta rays and whale sharks which are not as often seen in other Caribbean waters. Several varieties of turtle are there in numbers and the West Indian Manatee is sometimes sighted. By the time the current makes its way up to Tobago decreased visibility is no longer a problem. Tobago has shallow rich reefs with 300 species of coral including elkhorn, staghorn and fire coral, huge barrel and tube sponges, and a large variety of gorgonians, sea fans, plumes and whips. 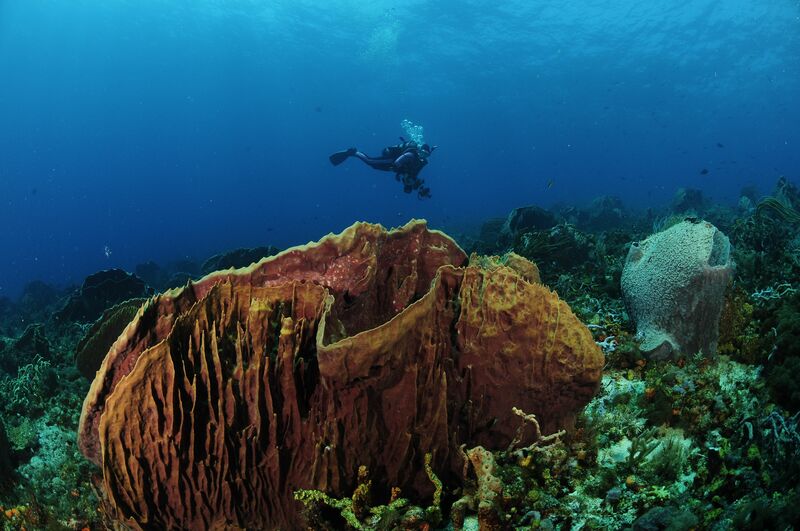 The north end is known for strong currents and its hard and soft corals, black coral and sponges. 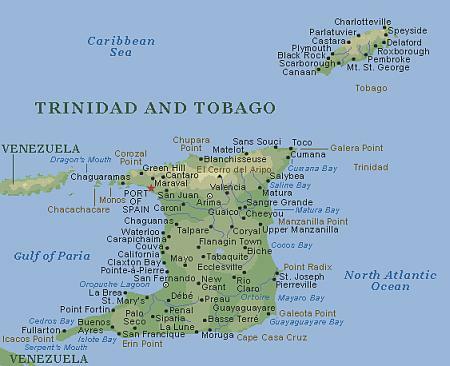 Highlight areas are Speyside, Little Tobago and Goat Island. The south end has less current and there are a number of mini-walls and sharks and dolphins. It is known for clear water at Nylon Pool and Buccoo Reef National Park. Featured Sea Life includes this list: crabs, nudibranchs, garden eels, squid, lobster, seahorses, octopus, moray eels, frogfish, scorpionfish, dwarf, Queen and French angelfish, blue chromis, bicolor damselfish, jacks, rainbow runners, black groupers, pork fish, big eye, glass eye and cubera snappers, blue wrasses, African pompano, barracuda, tarpon, manatees, dolphins, Bermuda chub, manta rays, blacktip reef sharks, scalloped hammerhead sharks, nurse sharks, whale sharks, Atlantic guitarfish, southern stingrays, torpedo rays, and hawksbill, green and leatherback turtles. Seasons and Conditions – It is consistently warm year round in Trinidad and Tobago. Daily temperatures range from 24-29°C (75-85°F). There is a rainy season from June to December when typically it is sunny in the morning and rains a bit in the afternoon. The islands are south of the hurricane belt and are not usually hit with big storms. Water temperatures average 25°C (77°F) in the winter months and 28°C/82.4°F in summer. At the coolest, divers will want to consider a 3 mm full or shorty wetsuit. Visibility runs from 15-30 meters (50-100 feet) around Tobago and around 10-20 meters (35-68 feet) near Trinidad. As indicated above, strong current does occur in the north end of Tobago. Some sites can be accessed from shore, but many will require a boat. Divers of all levels will find suitable diving in Trinidad and Tobago. Trinidad and Tobago is not an area renowned for liveaboard diving, but there are many cruises in other areas around the Caribbean. Click here to book a Caribbean liveaboard holiday. Piarco International Airport on Trinidad is the country’s major airport with regular daily flights from America, Europe and other Caribbean countries. Tobago also has an international airport, A.N.R. Robinson International Airport with less frequent service. The islands have a good highway system and a wide range of bus, taxi, shuttle services and car rentals. Ferries run between Port of Spain (Trinidad) and Scarborough (Tobago) and there is a water taxi service between Port of Spain and San Fernando to the south on Trinidad. Aside from seaside activities and beaches, Trinidad and Tobago has a very rich and diverse culture to enjoy. There are many historic buildings and sites, museums, galleries, gardens, shopping, food, restaurants, nightlife and natural sites including: Fort James and Fort King George, Main Ridge Forest Reserve, Nanan’s Coroni Bird Sanctuary, the National Museum and Art Gallery, Piparo Mud Volcano, Pigeon Point, the Royal Botanic Gardens, Stillmeyer’s Castle, Temple in the Sea, the Nylon Pool, Adventure Farm and Nature Reserve, Argyle Falls, Asa Wright Nature Center, Hindu festivals, Carnival, leatherback turtle nesting, mountain biking, traditional and underground music, Crusoe’s Cave, horseback riding, goat racing and many others. The video below provides a little context. I’m a big fan of scuba diving. I haven’t personally gone or done scuba diving myself, but I have always wanted to try it out. This article has all the information I would need about doing it in Trinidad. I’m not sure if I’m ever going there, but if I do this article is an essential one. Thank you so much for sharing this article. It is going to be a useful one for everyone who is traveling to Trinidad. You are back again. Thanks for your interest. You haven’t gone diving yet, but I see you do have the interest to check out my site. I explained to you earlier what it takes to complete a beginning open water diver course. I hope you decide to give it a try someday. If you have any questions, please get in touch. Thank you Joe for sharing ¨Best Trinidad and Tobago Vacations Scuba Diving¨ I quite agree that Trinidad and Tobago may be one of the best dive resorts location around the world, but I feel apprehensive visiting due to safety concerns. I understand that criminal activity is on the rise and tourists are sometimes targeted. Travellers have reported pickpocketing and armed assaults in certain parts of Port Spain. I’ve been told to be cautious after dark when leaving the nation´s main airport outside of Port of Spain, as incidents of armed robbers and accosting vehicles have been reported. On both islands, the US Embassy advises tourists to choose accommodation with adequate 24-hour security. You are also advised to always lock your car doors and stay on alert when visiting isolated beaches. Do you think these claims are exaggerated? Thanks a lot for your kind comments and concern for safety. Caution is well advised. I suggest anyone going to Trinidad and Tobago read this travel advisory from the US government – https://travel.state.gov/conte…, and this one from the UK – https://www.gov.uk/foreign-tra…. On a bit of a positive note, violence is considered rare. Where I recommended in my post to go diving is Tobago, where conditions are considered safer. I hope things will improve enough for these government agencies to provide more positive information soon.